So, K.J. Parker stepped out of the shadows and cast a light on the identity of the writer behind this pseudonym, that of Tom Holt. (I could have used some drums and made a longish pause here to heighten the suspense, but there is nothing surprising left of it since this news is over a week old.) I have very little to opinion on this, besides knowing precisely how to address K.J. Parker my consideration for his works doesn’t suffer any change whatsoever. K.J. Parker is one of my favorite fantasy writers, if not the top favorite. My only thought on this matter is that I hope K.J. Parker would continue to keep me busy with his novels and short stories in the future. I rest assured for the time being, K.J. Parker’s new novel “Savages” is coming this summer from Subterranean Press, while on September Tor.com publishes his novella “The Last Witness”. More than that, between these two Orbit Books will finish the publication of K.J. Parker’s serialized novel, “The Two of Swords”. 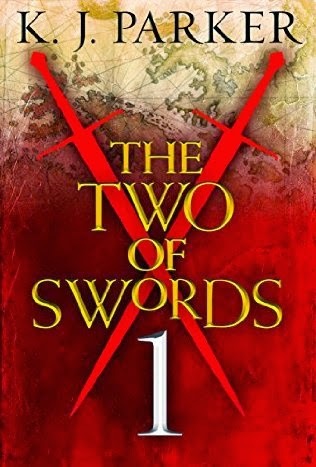 The first three parts of “The Two of Swords” are already available in various electronic formats, with the fourth coming on May and the rest monthly until September. There is a downside for me here, I am not very fond of serialized novels, since my patience is already put to a test by waiting for the books I wish to read to be released I am more willing to await the publication of all the parts of a serialized novel before starting reading it rather than wonder what happens in the next installment. It’s no easy task to do that with favorite TV shows or fantasy series. I just hope that when all the 8 parts of “The Two of Swords” are published a physical volume would be available also; I would certainly love to put it next to my copies of all K.J. Parker’s books. If you want to learn more about “The Two of Swords” or start reading it already you can find all the details on its dedicated website. I really like K.J. Parkers writing but I'm no fan of book serials. Therefore I will wait for a complete "The Two of Swords" edition. I totally agree with waiting for a physical copy of the serialized story. I'm very excited for Savages though! I read the excerpt you posted a while ago and it reminded me of his first trilogy. (Which has remained my favorite; The Company a close second) Truth be told I always had a suspicion that Parker was indeed male. Call me silly but his signature in my signed edition of Purple and Black just reeked of a dude signature. Nothing changes for me either, but I'm sure some people will inevitably bring up the whole sexist argument now;) Thanks for keeping everyone up to date on Parker news! This book sounds interesting, and if serialized, then I would like to wait for several instalments before beginning. Thanks, Mihai.